Worried About Ticks in Sydney? You Should Be! Just recently there has been a lot of commotion about new tick line procedures in QLD as a step in improving bio security in our agriculture industry which just goes to show how big of an issue the ongoing tick problem is in Australia. Ticks are known to be carriers of diseases that can not only affect cattle but people as well. Sydneysiders, especially those living near the northern beaches, know about the Paralysis tick and how it is one of the most dangerous pests to have lurking in your backyard! It is also the most common and problematic tick in this area (Sydney Northern Beaches). And when you consider their minuscule size, these ticks can certainly pack a punch as doctors and veterinary surgeons can testify. 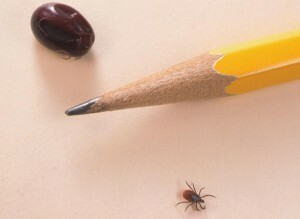 If you live along the east coast of Australia, the chances are you’ve seen a few ticks in your time. Paralysis ticks live in vegetation and dine on blood – and they’re not too fussy about their ‘host’. And while most people are aware that horses, dogs and cats can be affected by ticks, many don’t realise that children and sometimes even adults may also become seriously ill when a tick latches onto them. •Tick paralysis: when ticks remain on their host a variety of symptoms may develop including weakness in the limbs, headaches, partial paralysis (usually of the face), fever and/or rash, and even flu like symptoms. Children are more susceptible in this regard than adults. •Allergic reaction: some individuals display an allergic reaction to ticks. In many cases the reaction will be mild however, in some individuals a severe and life threatening allergic reaction – anaphylaxis – may occur quite quickly after exposure and if this occurs, medical attention should be sought as a matter of urgency. •Tick Typhus: relatively rare, tick typhus is a tick borne disease that may be transmitted from native animals to humans. Treatable with antibiotics, symptoms include headache, rash, fever, flu like symptoms and swollen glands. •Trim bushy shrubs and minimise foliage around your yard – ticks tend to move onto a host when the host brushes against or walks beneath the foliage the ticks are on. •Don’t keep shrubby areas too moist – ticks don’t like dry or very hot conditions. In NSW there’s only one approved product for the eradication of ticks and only licensed pest controllers are allowed to apply it. If ticks are a problem in your area regardless of these measures, it’s time to call in a professional pest control operator to assist with insecticidal control of ticks and help you to keep your kids and your pets a little safer. 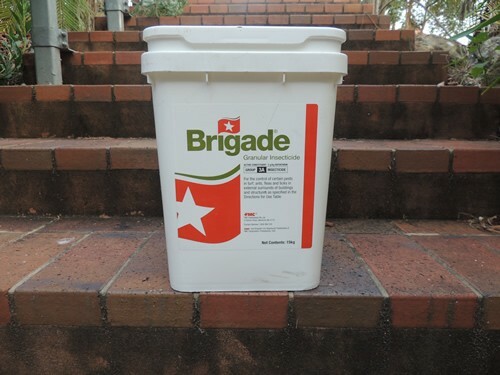 Brigade, an Agserv product, is currently the only product approved for tick treatments and tick control. As a bonus it’s also effective against other garden insects such as fleas. Not all pest contorl agencies use Brigade so make sure to book in with one that does, it’s been tested and proved to be an effective and long lasting tick treatment. We have always used Brigade and never get complaints about the treatment! The tick becomes attached to its host by inserting its sharp mouthpartas, which bear backward-projecting barbs, ensuring that it is held in place during feeding. At the same time, a material is injected from the salivary glands of the tick, and this prevents the coagulation of blood, which would cause the fine mouthparts to become clogged. It is this anticoagulant, and perhaps other materials, that is toxic to animals. Fatal paralysis in mice has been produced experimentally by injecting them with fluid from the salivary glands of ticks. The tick does not burrow into the skin; but because there is localised reaction to the presence of the tick which causes swelling of the skin, the tick appears to be embedded deeply. Once a tick bite has been detected, it should be treated immediately. Symptoms and treatment of tick bites. Some general details about ticks. Seasonal abundance – Ticks are usually more abundant in the November-December period, but weather conditions play an important role. Although numbers decline in winter, animal inspection must not be neglected at this time. Tick dispersal – Tick may be transferred from vegetation on such things as clothing and oicnic rugs, as well as animal fur. Ticks do not jump; they merly adhere to the body or legs of a passing animal.